Husky Liners makes Heavy Duty Husky Floor Mats … and that’s an understatement. These rubber floor mats for your car, truck, van or suv are made from an extremely thick and durable thermoplastic that is designed to resist temperature extremes, cracking, water, dirt, oil, gas and all kinds of other abuse you normally inflict on your car mats. Husky Mats are semi custom fit and match up with the front and rear floor pans in most cars, trucks, vans and suvs on the road today. You may have to trim the mats just a little to make them fit. They keep water and mud off your carpeting with raised edges and keep your feet out of water with ridges on the bottom of the mats. 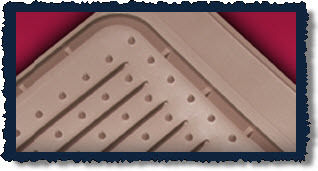 Husky Liners famous Sta-Put nibs, on the back of the mats, prevents slippage on the vehicles floor carpeting. Price wise these mats are between the Kraco Universal Rubber Car Mat on the low side and the more trendy, expensive, upscale car floor liner products from Husky Liners . The Kraco product is universal fit, so you’ll probably get a better fit with the Husky Floor Mat. The Husky Liners Car Floor Liner product line is of equally heavy construction but is designed to provide greater protection and coverage for your vehicles floor. The Husky Liner will, in general, trap more water and dirt than a normal car mat due to the depth of the liner and the slightly raised edges. Both the Kraco and Husky products benefit from the use of a universal absorbent mat to keep your feet out of the water that accumulates on top of these mats/liners. This feature may offset the price advantage of both the Husky and Kraco Universal Mats in some consumers decision. And you don't have to trim the Floor Liner product! So, it’s up to you. 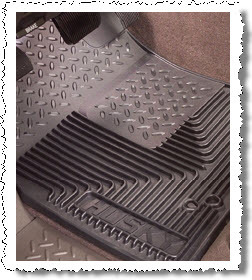 Check out Customer Reviews for the Husky Liners and Heavy Duty Floor Mats to help you decide which one to buy. Of course don't forget, if you want to save money and still get a great car mat, you can always pick up a pair of Kraco Mats at Sams Club or at many of your favorite department stores. This is a great example of a trade off in cost versus performance. You can’t really go wrong with any of the Husky Liners floor protection products. And heck for the $20 or so it costs for a front/back set of Kraco rubber floor mats at Sams Club – it’s hard to go wrong with Kraco!